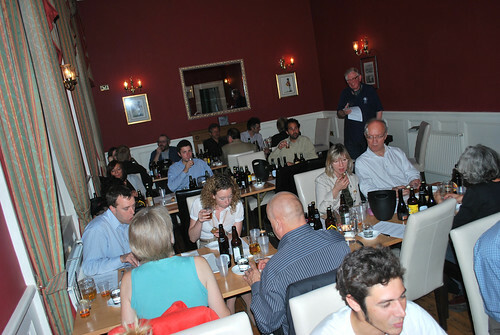 The themed for the evening was ‘beers brewed without hops’, which only became popular in the 13th Century. 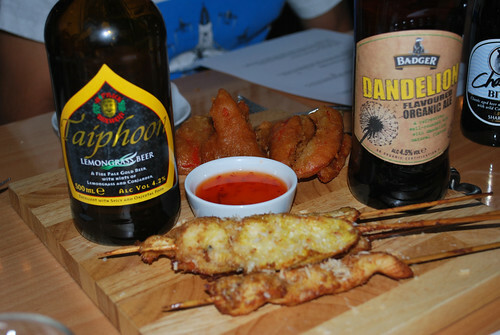 Before their introduction other botanicals such as dandelion, wormwood and heather were added to beer for flavour and to add some bitterness. Bill lined up a selection of beers that contain additional flavouring elements, and worked carefully with the Dispensary’s head chef and owner Dave Cambridge to produce an accompanying menu. My olfactory sense was somewhat diminished due to the onset of a bout of man flu, consequently my tasting notes reads along the lines of ‘yup, that tastes like beer’ so I’ve included below Bill’s thoughts. I say ‘unusual one to start with, I’d have perhaps looked a little further east that the Italian peninsular for the food match. It works fine, what with the saltiness of the ham, but I’m wondering if more could be made of the coriander flavoring, perhaps middle eastern style lamb? I say ‘Great combination, Scotch eggs being one of my favourite things on Earth, the beer’s bouncy, and despite the conk full of snot I can still detect the peaty heathery notes and the distant drone of a Runrig gig. William’s website declares heather ale has been brewed in Scotland since 2000BC. 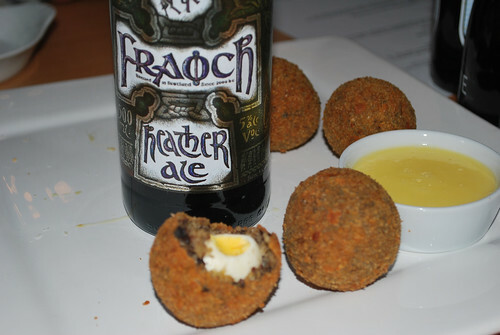 The peppery earthy taste and texture of the Scotch egg holds up well with the beer. Bill says ‘Coriander and lemongrass give an Oriental zing to this Pale Ale. Unusual and interesting in being brewed from a mixture of barley, maize and wheat malts. I say ‘there was a fair chili kick to the skewers, and the coriander was there in the beer, but I had trouble tasting any lemongrass. Tasty drop mind, and was light and refreshing after the heat of the chicken. Hopback brewery produce one of my all time favourite drops, Summer Lightning, the taste of summer as far as I’m concerned, that and rain water obviously. Bill says’ Light and golden organic bitter with herb aroma and bittersweet aftertaste. Dandelions have been valued for centuries for their herbal qualities and this beer style was an 18th century favourite. I say ‘Dandelions get a bad rep in the UK, pick them and you’ll wet the bed we were told as kids, which is based on their powerful diuretic nature (wonder if the same is true after a session on this beer?) and the heads come in handy for playing ‘what’s the time Mister Wolf?’ The people at my table detected a slight sweet grassy smell, but I’m drawing a blank due to the cold. The peppers were nice and sweet, not greasy. Hall and Woodhouse also make a pumpkin ale, which sounds fantastic, one for Autumn for sure. Bill says ‘An unpasteurized Lager that proves the Czechs can be matched. Gooseberry-infused it is clean and crisp with delicious floral aromas. I say ‘sausage and beer are natural bedfellows. Indeed the Grenadier Pub in Belgravia does sausages on the bar for a quid. Bill here confessed to not being a lager fan, and indeed it did sit oddly on the mouth after the other beers, there were comments on my table of a slight medicinal quality to it. Good bangers mind, all made from scratch by David. I say: Simply stunning, the best match by far, a match like Bjorn v McEnroe is a match, a match like Swan Vesta is a match. A match that in two mouthfuls triple jumps its way across three Continents looting tastes from the far east, south America and the home of time itself, Greenwich. The best one of the evening as far as I’m concerned. 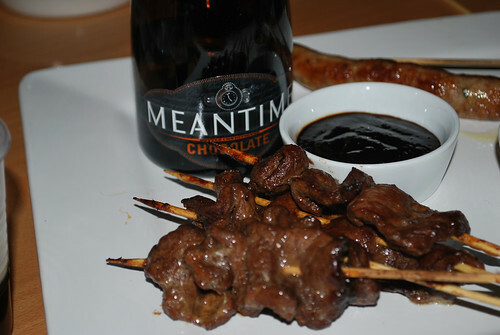 Even the back of the bottle sums up my attitude before trying it saying ‘Chocolate and beer! Are we mad?’ No sir. Eccentric perhaps, even genius, but not mad. It’s really something else; indeed I slow cooked ox cheek in it at the weekend. How do you follow that? Well, with something sweet, and from the same brewery too. Bill says: Vibrant red colour and mouth-arousing zesty finish. Challenges the classic Berliner weisses. 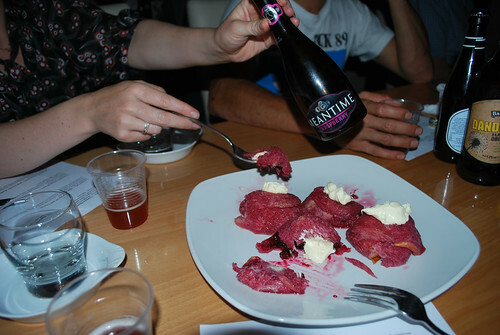 Secondary fermentation of the fruit sugars gives potent flavour and lingering aftertaste. I say: Another good combination, sharp and tart to finish off with and leaving our mouths puckered shut like a dogs bum… um, in a good way. For me the pairing of food and drink has always been more subjective that the pairing of flavours or ingredients on a plate. I don’t know about you but I’ve never taken as gospel the food suggestions on the back of a bottle of wine for example. Food’s relationship with drink is an open relationship in which pretty much anything goes, yes even red wine with fish for which James Bond once shot a man. When looking at food with drink, I’m looking for something more, some soul at the bottom of the glass maybe, some other reason for these tastes being together and why they work. I am however watchful of the biblical saying ‘eat, drink, and be merry’ and that at the end of the day drink is present on a table for toasting as well as tasting, so let’s not get to hung up about it. Far more interesting to my mind is the progress that’s been made. To think that 40 years ago we’d have been pairing a Whatney’s Party Seven with Marguerite Patten’s cheddar fondue or chicken in a basket. Today UK breweries are producing a broad enough range of beers to compliment and enhance almost every cuisine from across the globe. I’d even go so far as to say that the depth, range and colour of that palette is greater than that of wine, yet you’ll see few beers on sommeliers’ hefty tomes. If you’d like to find out more, the CAMRA website has a nice ‘rule of thumb’ page listing major ingredients and what ‘goes best’ with each of them. Cheers. When travelling round Britain last year I stayed in a small rented cottage in the West Midlands. 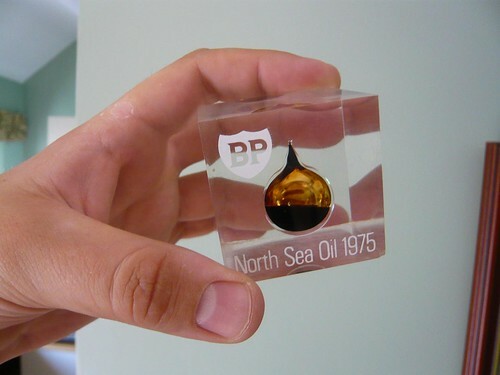 In a cupboard was a BP paper weight from 1975 containing a drop of the first extracted North Sea Oil. According to Crude Britannia BP was the first of the companies to find natural gas, but came late to the oil game behind Shell. Still, they some how managed to strike oil first and get it back to shore through a 100 miles of pipe sometime in 1975. The paperweight I held in my hand, according to the people I rented the cottage from, came to them via a friend of a friend who was high up in BP, and was produced as a commemorative edition. Remarkable to think that this tiny drop of fermented prehistoric plankton came out of the ground the year I was born. But back to the programme. Also impressive was the designing of the drilling rigs, which were built in newly constructed ship yards in the wild north of Scotland. Built on its side the rig was still 200 foot in the air, and must have stood out a mile against the landscape. (which reminded me of this a bit). Anyway, like a single subject episode of the Rock and Roll Years we barrelled through Ted Heath’s Government and Tony Benn’s attempt to claw some of the money back for the UK taxpayer, through the winter of discontent and the three day week, to arrive at the 1980s. The accompanying music to all this stock footage changed from prog rock to New Wave and suddenly there was Thatcher in a hard hat. 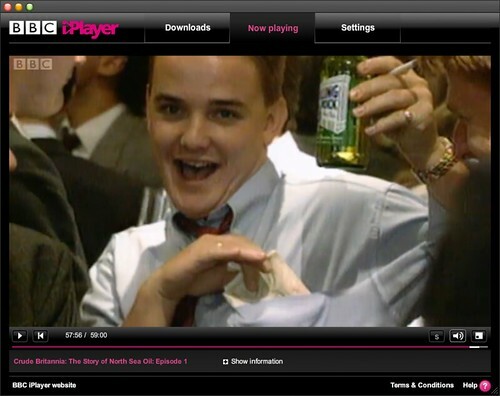 What came next was the standard 80s montage, culminating in this bloke drinking Rolling Rock and with a wodge of 20s in his shirt pocket. The clip has become a symbol of the 80s, and has been used across loads of programmes as a definition of the excesses of the period. I just wonder who he is? Does anyone know?